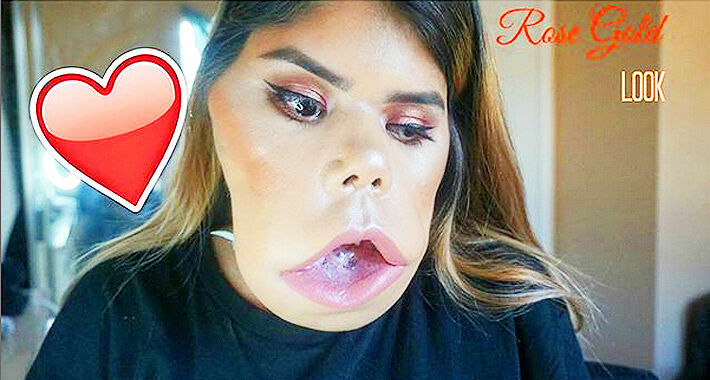 22-year-old beauty blogger Marimar Quiroa is proving a huge inspiration after she started up her own makeup tutorial channel MakeupArtistGorda66 on Youtube. Marimar was born with a condition known as cystic hygroma, causing a facial tumor which means she has to communicate in her videos using sign language. It also causes her problems breathing and eating. "It affects me in several ways." she explains. "I cannot speak, I breathe through a hole in my throat, I eat through a tube in my stomach and the hearing in my right ear is diminished." Marimar was so self-conscious about her appearance that she hid her face from people when she ventured outside her home in California. It's a far cry from a beauty blogger with a huge following on Youtube. "To me, beauty means to accept yourself for who you are, and to ignore what other people tell you, you show your beauty how it is—it doesn’t matter if you have a different-looking face. Accept yourself who you are." It's a message that is resonating with her online audience, she receives many message of support and thanks for being such an inspiration. She also has to deal with trolls and haters too, but she confronts them as she does people who stare at her in the street, by addressing them directly. However, Marimar Quiroa wasn't always so confident with herself and her image though, she's undergone many surgeries to reduce the size of the growths that have affected her mouth since before she was even born. So she spent years hiding from people and struggling to go out in public. But she's now embraced her features and as well as producing her videos is studying at beauty school. She's also spreading the word that you need to love and be happy with who you are, regardless of what other people think. "What I like about makeup and beauty is imagining new looks, especially around the eyes, and showing people they're beautiful no matter what." she notes. "It doesn't matter how you look or how you feel about your body. Accept yourself, accept your image—that's what matters. My condition doesn't hold me back in any way—there is nothing I can't do." You can check out Marimar Quiroa's YouTube channel here. And follow her on Instagram here. To me, beauty is accepting yourself and ignore other people judgement. -GORDA? Pony tail + hoops ??? Successful life is your self esteem cuz if you don't then someone will ??? Thank you so much @laurasboutique ❤️. In love with this outfit ? ?